Have you given proper thought to the arrangements for your financial security when you decide to retire or phase down your practice? You will need to consider all of the aspects and limitations that exist with this decision. This is not an easy feat as plan designs and features change all the time. 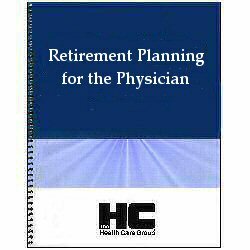 Retirement Planning for the Physician can make this simple and uncomplicated. This comprehensive publication addresses all issues from retirement, estate, and pension plans to buy-ins and pay-outs, including all ethical issues of practice closure. Sample letters are included for announcing a partnership, to announce a physician's retirement, for notification of a physician's death, and for physicians who are discontinuing their practice. Provides information to develop the best retirement strategy for your needs and situation; it is comprehensive in its coverage.